The US Air Force conducted its first “elephant walk” drill using a host of F-35 fighter jets on Monday. This batch of high-tech aircraft from the active-duty 388th Fighter Wing and 419th Reserve unit were launched to conduct a “combat power exercise” at Hill Air Force Base in Utah. They were intended to demonstrate the Air Force’s ability to “launch any number of aircraft to support the national defense mission at a moment’s notice.” Read more for the full video and additional information. “As intimidating as the F-35As look on the ground, it’s on another level to see them do a flyby (below). Launching at 20 to 40 second intervals, they flew the planes in multiple formations like flocks of incredibly violent geese, with all 36 airborne in just 11 minutes,” reports Engadget. 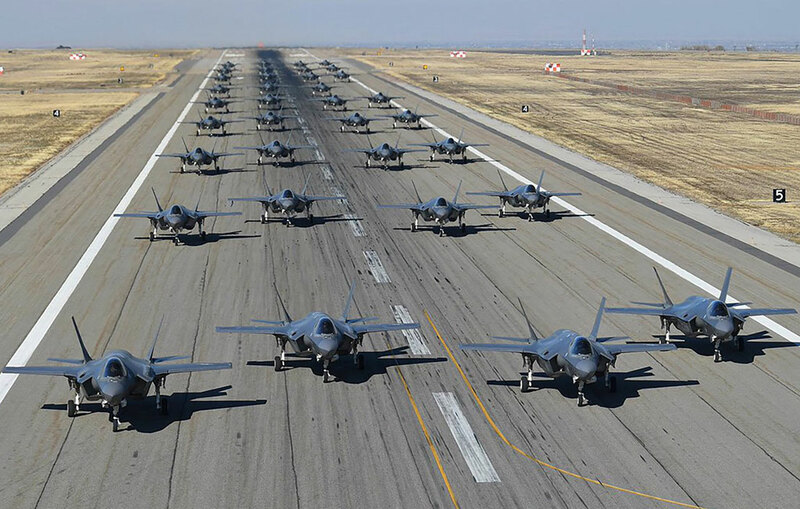 “We are ready to fight tonight, and exercising with multiple squadrons of F-35s can demonstrate our ability to defeat potential adversaries wherever they may arise,” exercise leader Major Caleb Guthmann told the Standard-Examiner.